Special fall rate! Beautiful lake view condo, balcony sunset, great location. Great location!!! This lakefront newly remodeled condo is located just off Highway 7 in The Landing Condominium Complex. 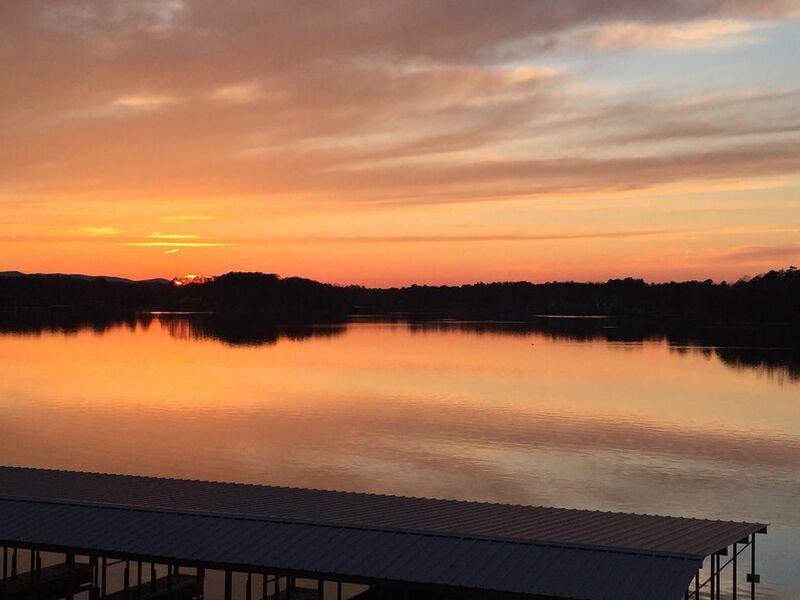 It is on the main channel of Lake Hamilton and convenient to all activities including restaurants, shopping, boat and water toys rental, Oaklawn Race Track, mini golf, and much more. The complex is gated with tennis courts and a swimming pool. The condo is 2 bedrooms, each with a king size bed, 2 full baths, a full service kitchen, washer/dryer, and a balcony to view the main channel of the lake and beautiful sunsets! There is a boat slip that is shared between two rental units. Please let me know if you are interested in using the boat slip at no additional charge (when available). This area around the condo is quiet and peaceful yet close to many activities in Hot Springs! You will not be disappointed! Vanity sitting area off of master bathroom. This condo was everything we needed. The lake was very quiet and peaceful and so beautiful. Condo was immaculate and well stocked. We used the kitchen a lot since we were there over Christmas and most restaurants were closed on Christmas day. We had all the cooking utensils and dishware and silverware that we needed to prepare our Christmas meal. Would definitely recommend this condo and would definitely stay here again. Lots of gratitude to the owners! Condo was great! Very cozy, comfortable, and in a great location. We will definately be back. The views of lake Hamilton from the Condo were breath taking. Our girls trip to Hot Springs was wonderful. We would love to have you girls back again!! Wonderful location with an amazing view! Very nice condo with an amazing view. We had an amazing weekend enjoying all that Hot Springs has to offer. Would love to stay here again! Very impressed. Lovely condo, very clean. We loved our stay. I would definitely love to stay here again. Absolutely stunning sunsets!!!! We really enjoyed our stay at this condo on Lake Hamilton. The view is great and the condo was clean and comfortable. One reason we chose this condo is there are covered boat slips right in front of the unit, but they don't block the view since it is on the 2nd floor. Thank you for your kind review view of our condo and property. I will note it’s on the second floor of the lake side view and the entry door is ground level parking lot which is very convenient. Thanks again and we would love to have you back as guests in our condo some time in the future. Very Nice With Great View! We enjoyed our stay at your condo and really appreciated the cleanliness and that there was adequate seating for living area and balcony. No negatives whatsoever! If anyone reading this is wanting to stay in Hot Springs and looking for a nice, clean, and cozy condo close to all the action (you're literally 30 secs to Central Ave)...you will not be disappointed by staying here!